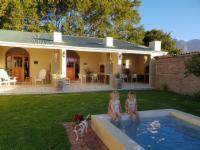 Franschhoek Farm Cottages have 6 cottages. 5 of them are on Bourgogne, which are 1km out of town and 1 cottage is on Montagne, which is 3 km out of town. Songold Cottage 1 km from town: this beautiful luxury apartment is on Bourgogne farm. The decor is stylish, yet functional, with a touch of gold. The queen bed comes with crisp clean white linen and is complimented by different shades of sand & stone. The en-suite bathroom has a big shower. We provide soft, white bath sheets. The kitchen is equipped with a fridge, microwave and induction plate. Come and enjoy a good cup of coffee on the patio, hanging chair or in the garden courtyard. Breakfast available at La Bourgogne restaurant, 5 min walk from the cottage. 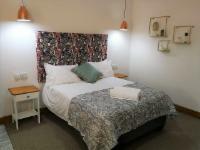 Plum Cottages 1km from town: These cottages are next to each other, great for a family or group of friend who want to break away together but still have their own space. 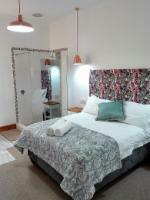 Each cottage can accommodate 2 adults and 2 children. Modern and beautifully decorated with patios, barbecues and a lovely garden with splash pool. Free Wi-Fi in cottages. Sonskyn Villa 1km from town: Lovely big family home with a large patio, barbecue and garden. 2 bedrooms and an extra day bed in the spacious living room. Free wi-fi and a portable speaker to set the mood. The farm dam is just a short walk away, best view you will find in the Bo-Hoek. The Royal Gala is the cottage that is 3 km out of town. 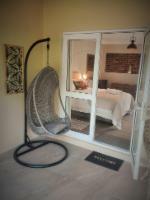 It is a lovely one bedroom cottage with everything that might need for self-catering. It is equipped with aircon, television, a barbecue and a cute little patio. 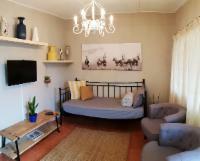 The cottage is peacefully decorated and is surrounded by an apple orchard, garden and the majestic Franschhoek mountains. There is a beautiful dam 40m from the cottage, but unfortunatley there is no swimming facilities at the Royal Gala. Guests are welcome to use the splash pool on Bourgogne. Family friendly: Best family escape in Franschhoek. Affordable and child friendly. Lovely farm experience. * Get 10% off for stays that are 7 nights or longer. This special is always valid. We stayed in the main farmhouse which was large enough to sleep six although there was just two of us. The house is large, comfortable and homely. It has a welcoming feel to it. There is a large verandah to sit out and a braai. There is also a plunge pool shared with the smaller cottages. The owners are lovely friendly helpful people and the farm dogs will visit you too just to say hello. What’s not to like about staying here. We would definitely recommend this and would absolutely stay here again. Christi is an awesome host. We felt welcome since the moment we arrived. We have a little one and she went out of her way to ensure we had everything we need to make the stay as comfortable as possible. The units are tastefully decorated with lots of thoughtful touches that make it that much more special. This is a working farm so you will definately run into some of the farm workers and see machinery but it didnt bother us that much and we were there with a baby. Thank you FFS for the stay and the fast Wifi. Franschhoek Farm Cottages is 0.9km from the centre of Franschhoek , the nearest airport 58.6km (Cape Town International Airport).